Three more women stepped forward Wednesday describing their experiences with former Vice President Joe Biden that left them feeling uncomfortable. A former White House intern, a former congressional aide and a woman who was invited to the Oscars because of her experience with sexual assault told The Washington Post about their interactions with Biden. Biden approached Vail Kohnert-Yount in the West Wing basement to introduce himself while she was a White House intern in the spring of 2013. “He then put his hand on the back of my head and pressed his forehead to my forehead while he talked to me. I was so shocked that it was hard to focus on what he was saying. I remember he told me I was a ‘pretty girl,'” Kohnert-Yount said in a statement to WaPo. Former Democratic staffer Ally Coll told WaPo that Biden squeezed her shoulders and held her “for a beat too long” while complimenting her smile during the 2008 election cycle. She now says his alleged actions were inappropriate. Coll currently heads the Purple Campaign, a nonprofit group that fights sexual harassment. Sofie Karasek’s alleged experience was the most recent one told to WaPo. She met Biden at the Oscars in 2016. He had introduced a performance by Lady Gaga, who invited a group of more than 50 sexual assault victims, including Karasek, to share the stage with her. Karasek said Biden grabbed her hands and touched his forehead to hers after she shared a story with him about a college student who had been sexually assaulted and died by suicide, according to WaPo. A photo of the forehead touch was posted and shared on social media with a positive spin, but Karasek said it felt like a violation of her personal space. Biden posted a video Wednesday in which he said he’s learning how to respect another person’s personal space and brought up “changing” social norms. He “still didn’t take ownership in the way that he needs to,” Karasek told WaPo. 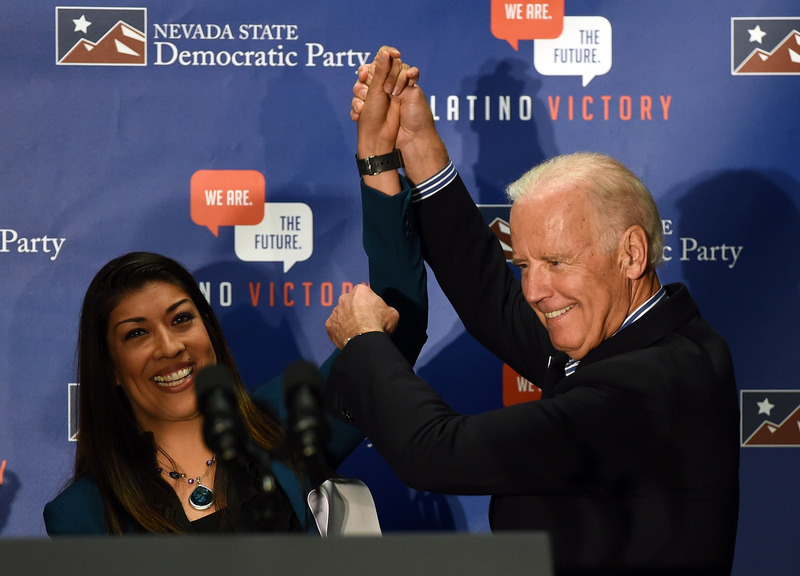 Former Democratic Nevada Assemblywoman Lucy Flores started a domino effect Friday when she accused Biden of sniffing her hair and kissing the back of her head without her consent in 2014. He was campaigning for her at the time.